Early last month, the Denver Art Museum raised the curtain on "Super Indian: Fritz Scholder, 1967-1980," an exhibition featuring about 40 colorful, rarely seen artworks by a controversial figure who died in 2005. 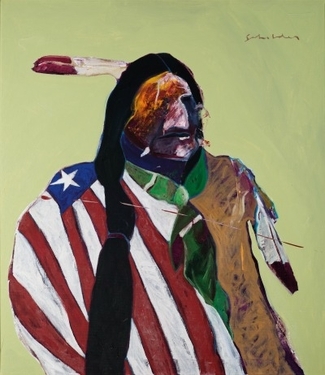 Mr. Scholder, who blended figurative and Pop Art influences into his own style, challenged the stereotypical depiction of American Indians as one-dimensional — showing them instead, for example, as real people with beer cans or draped in United States flags. And though he said he was not Native American (he was one-quarter Luiseño), Mr. Scholder was part of the New American Indian Art movement, which brought Native American artists into the contemporary art world and infused their work with more freedom, more possibility and more visibility. Scholder's "American Portrait with Flag"
The exhibition for this trailblazing artist fits the Denver Art Museum like a pair of well-worn moccasins. The museum has also done much to change the stature of Native American art. At a time when many Native American artists still hold grievances against mainstream art museums, the Denver museum is proving itself to be different, winning favor from many, but not all, Indian artists and curators. The museum's commitment dates to 1925, when it bought a group of Navajo textiles long before most art museums paid any attention to Native American art. Its interest flourished after 1932, when Anne Evans (1871-1941), who collected Native American art and organized exhibitions, donated her trove. Her longstanding interest in this art may have been partly atonement for the views of her father, John Evans, who in 1864, as governor of the Colorado Territory, authorized citizens to pursue and kill "hostile Indians." In the ensuing Sand Creek Massacre, many unarmed men, women and children were murdered. Not long after her gift, a Native American art curator at the museum, Frederic H. Douglas, helped organize one of the first national exhibitions of Indian art, which took place at the Golden Gate International Exposition in San Francisco in 1939. Significantly, from the start the Denver museum chose objects with aesthetics in mind, rather than the ethnographic significance that commonly gave them a place in natural history museums of the era. Its collection, now nearly 20,000 objects, ranks among the best in the United States. In recent years, the museum has plunged into showing and collecting contemporary Native American art — which many art museums ignore, to the dismay of living Indians. 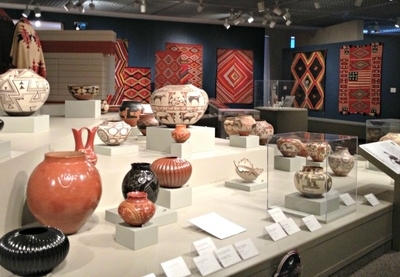 "Our collection's approach is to expand the recognition of contemporary art by American Indian artists; engage local, regional and national American Indian artists; and highlight the artistic mastery from the past," said Christoph Heinrich, the museum's director, "but always with an eye on ongoing creative tradition." To remain current, the museum regularly hosts an Indian artist in residence, who develops new work in the museum and interacts with visitors, answering questions as he or she works. The museum now devotes more space to Indian art than any other general art museum (but not, of course, such specific treasuries as the National Museum of the American Indian). "It's curated beautifully," said Dyani White Hawk, a Sicangu Lakota painter based in Minneapolis, who has visited a few times. "It has so many artists I really admire, and nothing seems cheesy — and that's not that common." 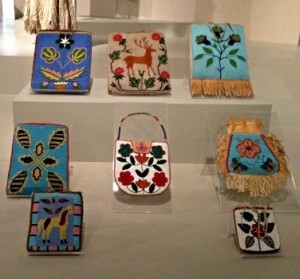 Under Nancy Blomberg, the museum's chief curator and its curator of native arts, the institution has pioneered efforts to identify and credit individual Native American artists who historically have not signed their objects, rather than follow museum convention and simply name the artist's tribe. It frequently holds Native American art symposiums and lectures, and in mid-September hosted its 26th Annual Friendship Powwow and American Indian Cultural Celebration. Yet the museum has been faulted because neither Ms. Blomberg nor John P. Lukavic, the department's associate curator, is Native American. And both studied anthropology, not art history. Many much larger institutions, including the Metropolitan Museum of Art and the Los Angeles County Museum of Art, have no full-time specialized Native American curators, let alone two. But Joe Horse Capture, a Gros Ventre Indian and veteran curator of Native American art currently employed by the National Museum of the American Indian in Washington, said: "Ideally, museums that have Native American collections should have Native American curators. It's not easy, but it's possible." He also criticized the anthropology degrees. Mr. Lukavic noted that his two predecessors were Native Americans and that he chose to get an anthropology degree rather than one in art history partly because the financial subsidies for graduate students in that field were larger. Mr. Horse Capture was not entirely negative. He acknowledged the Denver museum's "huge collection" and said, "I know several of the artists who've had residencies there, and all of them said they have had a very good experience." Bruce Bernstein, who once directed the Santa Fe Indian Market and has held curatorial jobs at Indian art museums, went further, saying, "Native American artists are standing in line to work with Nancy." Ms. White Hawk, who knows and says she admires artists whose works are in Denver's collection, said she was also impressed by the stature of the residency: "It's an obvious part of their mission." Bringing in Indian artists from time to time dates to the 1930s, in fact. But after opening a new installation of the collection in 2011 — which began with a spot where an artist, Roxanne Swentzell, worked on a sculpture — the museum actively raised funds to formalize the residency. It now hosts three local or regional Indian artists and one national artist each year. "Visitors told us how important it was for them to see a working artist; people expected it," Ms. Blomberg said. The artists have included Marie Watt and Jeffrey Gibson. The museum is also developing a base of supporters of Native American art. Vicki and Kent Logan are the leaders to date; they have promised to donate nine Scholder paintings and 25 ceramics by Virgil Ortiz, among other works. But local and regional support is not deep enough for the institution's goals, and Ms. Blomberg and Mr. Lukavic are seeking national support. In the last few months, they've gained donors in Santa Fe and Los Angeles, for example. Mr. Lukavic is also working toward a crowning achievement: "If I can put together a show that lands at MoMA or SF MoMA or the Hirshhorn, that's a goal," he said. "There are Native American artists working at that level."